If you are looking for a nice compact car that will get you where you need to go and do it with style and flare then the Toyota Aygo is a care you are going to want to look into! The five-door design allows for quick and easy access to any part of the interior and with 4 comfortable seats it is a great vehicle for trips, vacations, business meetings, or any other travel needs that you may have. It comes with a manual drive, air backs, anti-lock brake system, gets great mileage, is rated for low Co2 emissions, and has several colours that you can choose from. 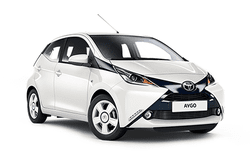 If you want a safe, stylish, fuel-efficient and affordable rental, then give the Toyota Aygo a try!